In general terms, the Romans coined the name 'Gaul' to describe the Celtic tribes of what is now central, northern and eastern France. The Gauls were divided from the Belgae to the north by the Marne and the Seine, and from the Aquitani to the south by the River Garonne, and they also extended into Switzerland, northern Italy, and along the Danube. By the middle of the first century BC, the Eravisci were a minor tribe that was located along a narrow band of Celtic settlement close to the Danube. They occupied territory in Pannonia, on the western side of the river, now part of the city of Buda in Hungary. They were neighboured to the north by the Hercuniates and Osi, to the north-east by the Anarti, to the east by the Sarmatian Iazyges, and to the south and west by Illyrian tribes. Sometimes called the Aravisci or Eravasci, the tribe's name is a peculiar one that resists a proper breakdown in the Celtic language. Removing the plural suffix, '-i' leaves two core elements. The closest discoverable matches to the first element are in Latin: 'erus', meaning 'master, owner, lord', and 'era', meaning 'mistress, lady' - although these are very shaky potential matches. The second element may be related to the Latin 'usque', meaning 'all the way, up (to), even (to)', or 'usquequaque', meaning 'always'. So perhaps the tribe could have been something along the lines of 'the always lords'. This is highly tentative, and the lack of a clear translation along with the tribe's location would suggest a Venetic connection for the name - maybe a Venetic tribe that was taken over by a Celtic warrior elite. Tacitus describes the Aravisci (as they are named in his text) as being German, of the same original group as the Osi to the north. He thought them to be a single group originally, but was uncertain whether the Osi had divided from the Aravisci and moved north, or the Aravisci had divided from the Osi and migrated south. His information would have come through contact with the Aravisci ruling elite, so they at least were German. The rest however had probably been recently conquered by those Germans, no doubt during the fall of the Boii at the end of the first century BC, or soon afterwards as German tribes took command in the region. So a German ruling elite ruled over whatever may have been left of the former Celtic elite and the possible Venetic peasants. The tribe's territory was in Dunaújváros in Transdanubia much of which was under their control. Their main settlement was on Gellért Hill (in Buda), a perfect site for a defensive hill fort. Another important settlement was at Aquincum, which became a Roman military fort after the tribe was subdued. This was situated on the right bank of the Danube at an important crossing point. The Latin name is probably based on its Celtic original, with the proto-Celtic dictionary supplying *akʷā- (modern 'aqua'), meaning 'water' to form the core of that older name. The second part may be cognate to the Latin 'incolo : incolere', meaning 'to inhabit, reside somewhere, dwell (in)'. That would make Aquincum the 'residence [by the] water'. Little else is known of them except that they were highly cultured. They worked with iron, minted their own coins, and decorated their earthenware pots. There is the possibility that they (or their Celtic elite) migrated into the region in the fourth or third century BC, almost certainly following the Danube from the west. Following recent success in battle at Histria, relations between the Getae and their neighbours in the Balkans undergoes a notable deterioration. Suddenly, under the leadership of Burebista, who is apparently guided by a wizard called Deceneus, the Getae launch a succession of brutal attacks on their former allies. The Celts seem to be first on the list, and the territory of the Boii and Taurisci are laid waste, with the Boii especially being almost genocidally exterminated by Burebista's brutal onslaught. The Eravisci find themselves sitting on Burebista's line of march towards the Boii lands, but they escape him by leaving their villages in what is now Pest and barricading themselves in their fort on Gellért Hill. The tribe mint a series of coins that derive from Roman originals, revealing access to Roman coins (and probably goods), either through direct or intermediate trade. Archaeological finds of these have been numerous enough for an impressive catalogue, showing that production is hardly limited. 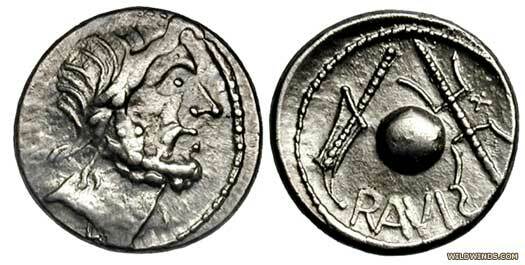 The tribe is the only one to print their name on their coins and the only one whose coins are based exclusively on Roman republican coinage. The tribe is eventually subdued by Rome, but the creation of the province of Pannonia is poorly recorded by Roman authors, especially in eastern Pannonia. It seems possible that the tribe becomes an ally in order to keep it out of the anti-Roman revolt of the Celtic tribes to the south, especially that of the Scordisci. If the proposed German takeover of the previously-Celtic commanded Aravisci has already been completed, then that would be another reason to avoid getting caught up in a purely Celtic revolt. German tribes are usually reluctant to be commanded by Rome however, so the number of Germans in the ruling elite may only be small, and therefore not fully secure in power. Aquincum is turned into a military post and when the province is divided in AD 106, this becomes the capital of Pannonia Inferior. Tombstone reliefs from this early Roman period continue to show a strong sense of Eravisci culture, especially on tomb reliefs which picture Celtic dress and jewellery. Around this time, a 500-strong cavalry unit arrives on Eravisci territory, and a Roman legion of 6,000 men is stationed at the fort of Aquincum by AD 89. The later Roman city springs up around the post and it flourishes.